Go greens. In August our gardens are beginning to bring forth a bounty of good things and fresh greens are one of them. Greens are an easy vegetable to grow and grow abundantly they do. I love being able to walk outside and grab a handful for dinner. My family is a big fan of arugula, and I use it all the time. Sometimes I throw it into a dish at the last second, sometimes I put it underneath tossed with lemon juice and olive oil, or sometimes I dress it and pile it on top of a dish to add height, freshness and lightness. It might also be the star of the show when I use it as an entrée salad. Greens abound with substantially beneficial nutrients. They are one of the most important foods that you can eat to improve your health. Cellulose is the structural component of green plant cells, and this fiber is great for keeping our digestive processes moving. The fiber makes it filling, yet it contains very few calories. The nutrient punch it packs is substantial. Lots of Vitamin C, Vitamin A, calcium, iron, B Vitamins and many great minerals. 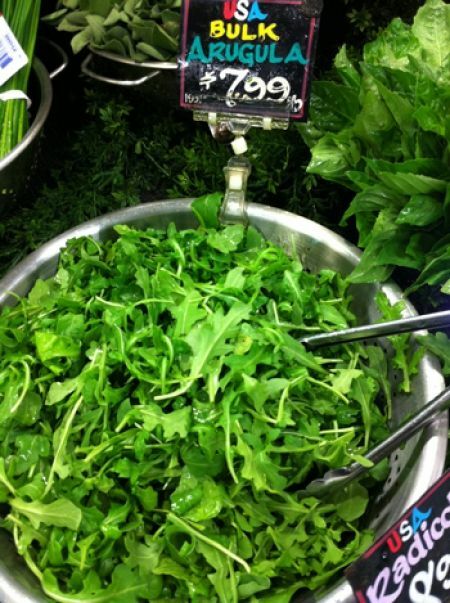 Arugula does not contain oxalates therefore your body can easily access the beneficial iron and calcium it contains. (Spinach on the other hand keeps its iron and calcium bound and gagged by oxalic acid. Cooking can help unbind it.) Forget cholesterol in arugula, it isn’t there. It has a glycemic index of zero, so it is not going to give your bloodstream any big sugar highs or lows either. It does contain some great Omega-3 and Omega-6 fatty acids, the anti-inflammatory superheroes that do your body good. Arugula is part of the family of cruciferous vegetables, and surprisingly it calls broccoli, cauliflower and bok choy its “people.” You can taste that familiar sulfur flavor, which is common in all of them. Greens help defend and protect your body from such bad actors as heart disease, cancer, diabetes and eye disease. Other leafy greens play a huge role in healthy eating and you can find a great list of these at webmd.com/diet/healthy-kitchen-11/leafy-greens-rated. Try to incorporate greens in your diet any way you can. It’s an easy way to add vegetables to your day. Even sprinkling a little bit of fresh chopped parsley on your food is a great idea (and there is that nice side benefit of its ability to freshen you breath!). Remember that the darker a green is, the more nutritious it will probably be. So this month, give new meaning to going green by striving to be green not only on the outside, but inside too!